You'll be £20.00 closer to your next £10.00 credit when you purchase From Arromanches to the Elbe. What's this? It was on 14 June 1944, D+8, that the tanks of the 144th Regiment Royal Armoured Corps began to disembark on Gold Beach as part of the Normandy landings. The men of the 144th soon found themselves in action – the start of a long and bitter campaign that would take them across North West Europe into the heart of Germany. During that advance the regiment took part in a number of important actions. These included Operation Pomegranate (July 1944), Operation Totalize, an innovative Canadian-led night attack which was one of the final steps to breaking out of the Caen bridgehead (August 1944), the siege and capture of Le Havre and the fighting in Holland during late 1944. The regiment helped to push back the last big German offensive in the Ardennes – one of the few British units involved – and was then the first British unit to cross the Rhine. By this time it was equipped with amphibious Buffaloes, and one carried the flag which had accompanied the first British tanks to cross the Rhine after the end of the First World War. Just before the end of the war in Europe the regiment helped British troops capture Bremen, and American troops cross the Elbe. The author began to investigate the regiment’s service through his late father-in-law, Captain R.W. Thorne, who had been an officer in it during the war. 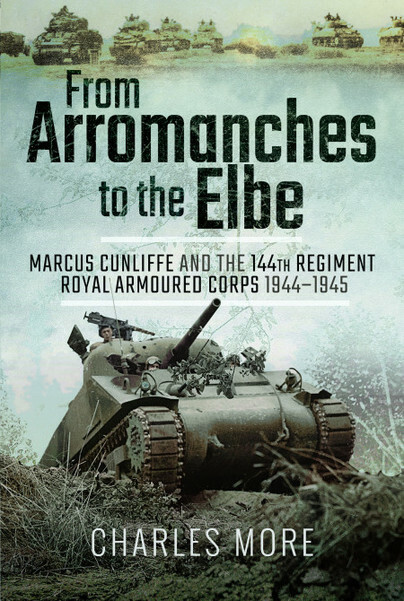 As well as extensive interviews with him about the regiment and the campaign, this book draws on a variety of contemporary sources – not least of which are the archives of fellow officer Marcus Cunliffe. Cunliffe, who went on to become a distinguished British scholar and author specializing in American Studies (particularly military and cultural history), had kept a detailed and graphic diary and written a number of lively and informative accounts – all of which are now in the George Washington University in Washington DC. Unsurprisingly, Cunliffe’s work features heavily in this publication. Arromanches to the Elbe is a serious contribution to the history of the Second World War. As well as exploring all aspects of army life, such as training and what might be called the social history of an active service unit, this book will appeal to those interested in the campaign in Europe as a whole, the use of tanks and armoured warfare in general, and, of course, the final battles to defeat Hitler’s Third Reich. CHARLES MORE taught at the University of Gloucestershire where he published numerous books and articles. Since retiring his books have included The Road to Dunkirk (Frontline 2013). He is a Fellow of the Royal Historical Society.